Of February 26th the 11st studio album from the mighty ANTHRAX will be released and Overdrive can safely say that “For All Kings”, is up there with the best of the bands previous releases. 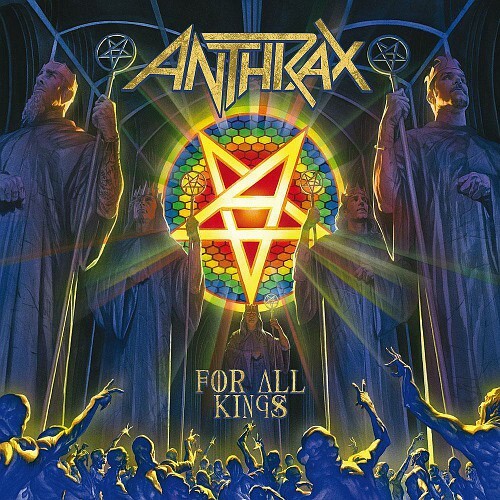 If you’re interested in finding out more about “For All Kings”, then step inside the world of Anthrax for an update on the recording process behind the bands forthcoming album. When it came time for thrash legends ANTHRAX to start the writing and recording process for the follow up to 2011’s Grammy-nominated Worship Music, there was no doubt that the entire band wanted producer Jay Ruston there with them from the start. Ruston first worked with the band during the final stages of Worship Music but for this new album, he has been there every step of the way. In the most recent album trailer released by the band, Scott Ian, Frank Bello, Charlie Benante, Joey Belladonna and Jonathan Donais talk about Ruston’s invaluable contribution to the making of For All Kings, due out February 26th. Check out the video below. The album will be in stores on February 26th, 2016 and is available to pre-order here.